In the first of a series of blogs looking at our web acceleration technology Webcelerator, we break down the basics of what Webcelerator is. A Webcelerator is, at the most basic level, a caching HTTP reverse proxy that sits between your web servers and the internet, intercepting HTTP requests that come to and from your server and where possible delivering the request content directly from the Webcelerator cache. This is significantly faster than serving content from Apache, nginx or IIS webservers, and it will reduce the amount of load on your backend servers under high traffic conditions – an area where the Webcel really shines! High traffic sites are the Webcel’s bread and butter. It’s more than capable of handling thousands of requests per second without breaking a sweat. Because most of the requests that the Webcelerator is handling will be served from the cache, it will reduce the amount of processing your webservers need to perform. For example, if your Webcelerator is handling 500 requests a second with an 85% cache hit rate, this means that out of those 500 requests, only around 75 actually went to the webserver itself. These features mean the Webcelerator can increase the capacity of your solution to handle high bursts in traffic, reducing the need to purchase additional web servers and keeping your site stable and responsive when under heavy load. It will also reduce CPU usage of your webservers by taking on duties such as page compression and SSL encryption. Page compression could significantly reduce your bandwidth costs if you have not implemented this at the webserver level already. The Webcelerator is specifically tuned for the task of dealing with high-performance websites, with everything from the TCP stack upwards configured for its role and your individual needs. Perhaps most importantly, with a UKFast Webcelerator you will have direct access to a team of trained engineers who will help you get the most from your Webcel, providing you with assistance and advice around the clock. How does a Webcelerator fit into my solution? 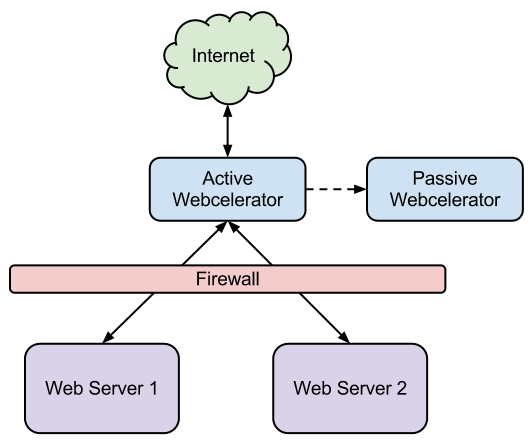 The Webcel sits outside of the firewall, most commonly in an active/passive pair. Should the active Webcel fail for some reason, the passive Webcel will detect this and take over. This failover should take no more than a few seconds so most users won’t even notice any disruption. As in the diagram above, the Webcelerator can load balance between as many backend webservers as necessary for your solution, from one to a hundred (although please don’t have a hundred backends – you’ll upset the engineer configuring your Webcel!). It can also sit in front of a single webserver and perform just as admirably. Out of the box, a Webcelerator will give you some of the benefits described above, but for it to truly shine our engineers need to work with you to get the Webcelerator tuned to your specific requirements and setup. For example, a Webcelerator can cause some problems with sites that aren’t expecting to be cached (such as losing sessions). There’s also the possibility that code changes may be required on your websites in order to handle some things (such as HTTPS redirects when offloading – we’ll cover this later). All of these issues can be tested and fixed without affecting your live site, so don’t worry! The rest of this blog series should help you to avoid some common pitfalls and get the most from your Webcelerator in the shortest time possible!